APPEARANCE: Poured a hazy, burnt amber color. Bright and beautiful looking beer. Nice big off white pillowy head, great retention that leaves sticky lacing down the side of the glass. AROMA: Very dank, herbal and hoppy. Bright fruits, grapefruit lots of lemon. Hints of wet grass, with bready malts on the backend. Bouquet is super inviting cant wait to taste this beer. TASTE: Lots of grapefruit on the front. Very oily like a zombie stirred this with his finger. Citrus notes pop again in the middle with the hops before finishing with Carmel and pale malts. MOUTHFEEL: Medium body with medium carbonation. Slick and oily with snappy finish that leaves you wanting another sip. OVERALL: I had to keep reminding myself this is a pale ale. It drinks wonderfully and has such a good hop presence that it could be a mellow ipa. Lived up to the hype that surrounds it. The art work is amazing! 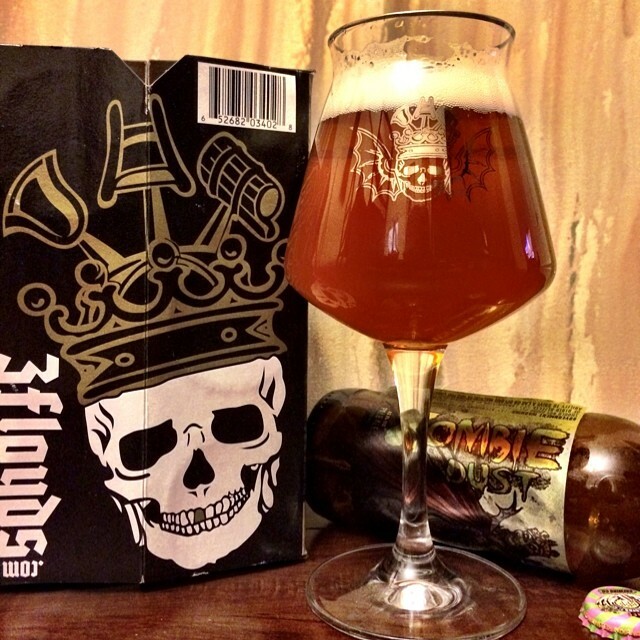 This entry was posted in Ales/IPA, Beer Reviews and tagged #beer, #beergeek, #beerme, #beernerd, #beerporn, #beerreview, #beerzombies, #craftbeer, #craftbeerlover, #dtlv, #ipa, #lasvegas, #lv, #sincity, #zombie, #zombies, American pale ale, fff, IBU, pale ale, Three Floyd, threefloyds, Zombie Dust, zombiedust by beerzombies1. Bookmark the permalink.